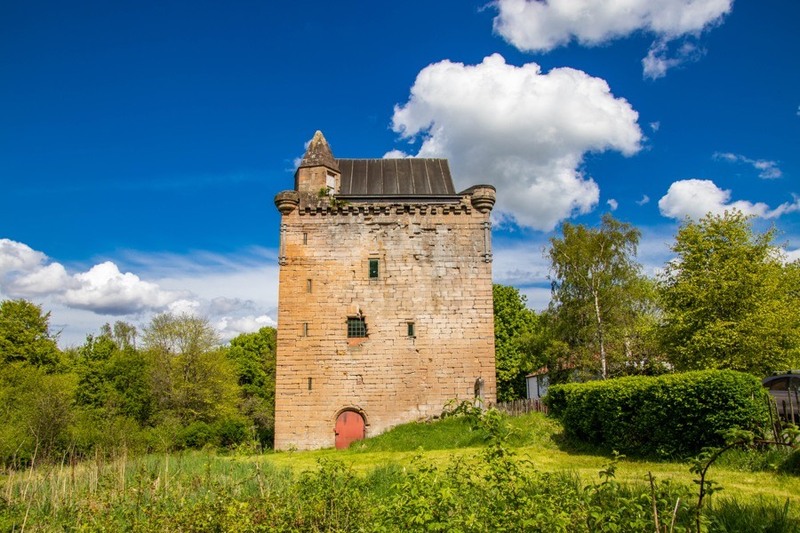 Sauchie Tower is a 15th century tower house belonging to the Schaw family which may have stood on the site of an earlier castle. 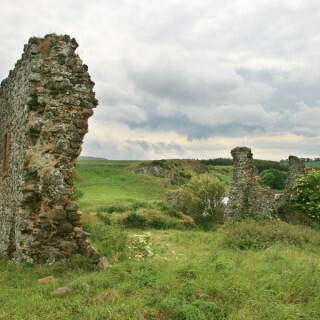 The lands of Sauchie were granted by Robert the Bruce to Henri de Annand, Sheriff of Clackmannan, in 1321 but whether or not a castle was built at this time is unclear. Almost a century later Sauchie passed to Sir James Schaw of Greenock, Comptroller of the King’s Works for James III, when he married Mary de Annand in 1431. 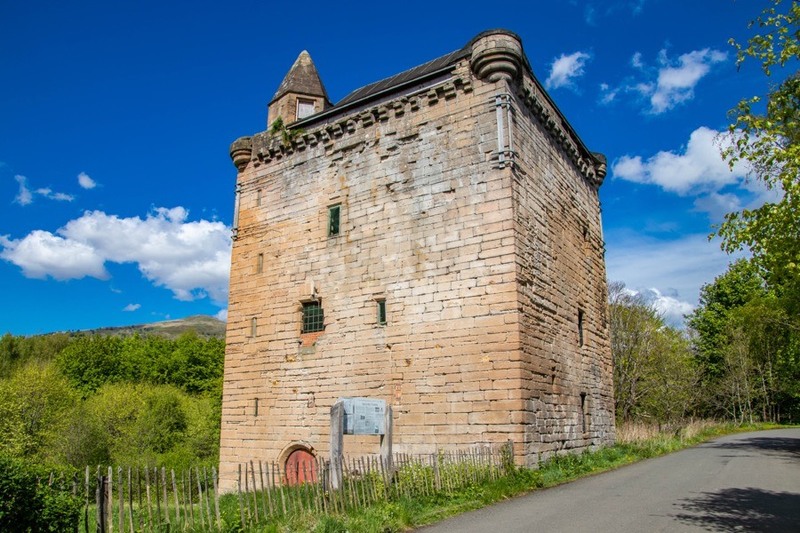 Sir James is thought to have built Sauchie Tower soon after. The tower is situated on slightly raised ground on what would have been the marshy flood plain of the River Devon to the north. The north side of the site was built up to form an artificial terrace while the west side was defended by a ditch running approximately north to south and the topography suggests that there may also have been a ditch along the south edge of the site. 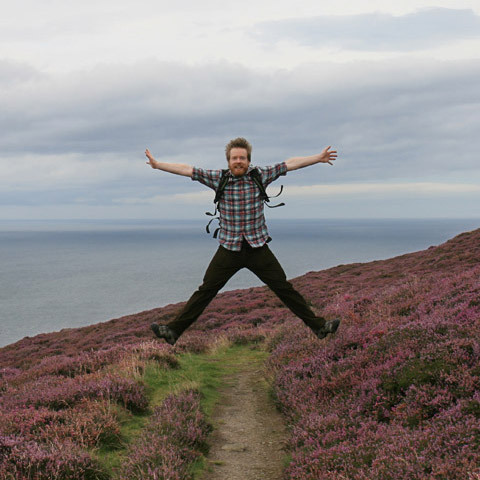 The tower consists of four main storeys and a garret and measures around 11.5m by 10.3m. The north, east and south walls vary in thickness between 1.6m and 2.0m while the west wall is over 3.0m thick and contains intramural chambers. The entrance is at ground floor level towards the north end of the west wall of the tower and leads into a lobby within the thickness of the wall. Off the north of the lobby is a spiral staircase in the north-west corner of the tower while off the south is a small chamber for a guard, within the thickness of the wall. The basement consists of one main chamber measuring around 8.0m north to south by around 5.65m east to west. A well is sunk into the floor of the chamber and partly recessed into the south wall in a semi-circular fashion. At the south end of the west wall of the main chamber is a doorway leading into a small cellar, contained within the thickness of the wall, which features two gun loops. Corbels support a wooden entresol above the main chamber. The entresol level also consists of one main chamber, with a vaulted ceiling above. A recessed window with bench seats is contained within the thickness of the south end of the west wall. To the north of this, also within the wall thickness, is a long, vaulted kitchen, accessed directly from the staircase, at the south end of which is a fireplace wider than the room itself. The fireplace was later blocked with the addition of a domed oven suggesting its reuse as a bakehouse. On the first floor is the main hall, measuring around 8,1m by around 5.7m, with a large, carved fireplace in the east wall. Immediately to the north of the fireplace is a large recessed window with bench seats. A large recessed window on the west wall leads to a private chamber while there is a further recessed window in the south wall. The north wall features a mural garderobe and a small basin. The main chamber at second floor level is larger than those below it due to the lack of intramural chambers in the west wall. The east, south and west walls feature windows with bench seats and there are small L-shaped chambers within the north-east and south-east corners. The third floor is less well-preserved but is of a similar size to the second floor and a small fireplace, a pair of cupboards and a window all survive in the south wall. The spiral staircase continues up to a small hexagonal caphouse with pyramidal roof at the north west corner of the tower, giving access to a broad parapet walk which is supported on double corbels and features open bartisans at each corner. The tower was once surrounded by a courtyard wall, thought to also date to the early 15th century, a section of which can still be seen to the north. A range of buildings was built east to west along the inside of the north wall, with a chamber, great hall, kitchen and probable bakehouse. The original entrance to the cobbled courtyard is thought to have been in the west wall. 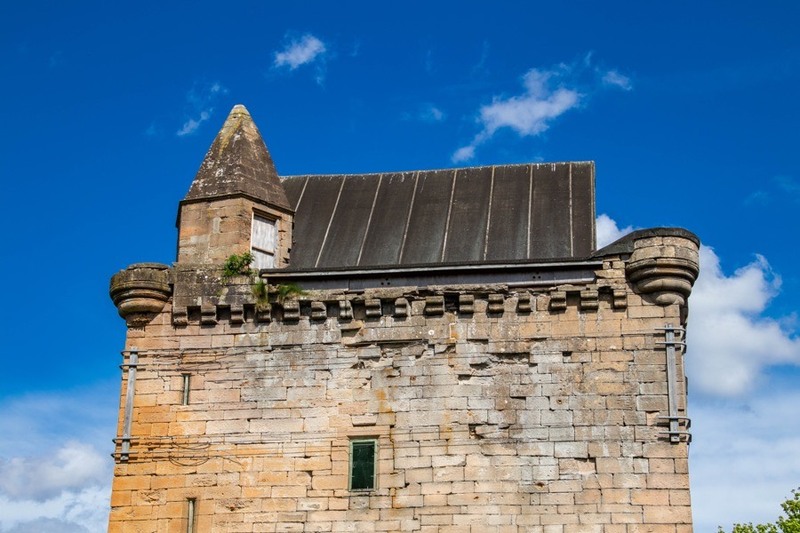 Later in the 15th century dumbbell gun loops were inserted into the west wall and a round tower was added at the north-west corner with similarly-shaped smaller gun loops providing cover along the west wall. The chamber at the west end of this hall range and the north-west corner tower were later incorporated into a two storey mansion house which was built against the inside of the courtyard wall by Alexander Schaw in 1631. 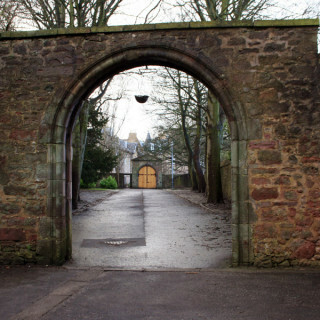 Old Sauchie House, as it later became known, consisted of two vaulted ground floor chambers. The westernmost chamber of the earlier hall range was repurposed as a kitchen in the north chamber of the new building while the north-west corner tower was partly infilled and used as a small vaulted side chamber. Early in the 18th century the hall range against the north wall of the courtyard was demolished and the wall taken down to allow access to a terraced garden to the north. A relatively substantial lean-to building was constructed against the north wall of the tower around this time, possibly a byre or stables. 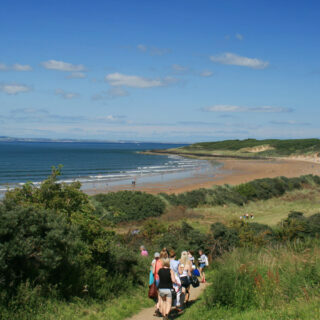 Around 1930 the site was bought by the Coal Board, who operated a colliery to the north, and soon after Old Sauchie House was largely demolished. 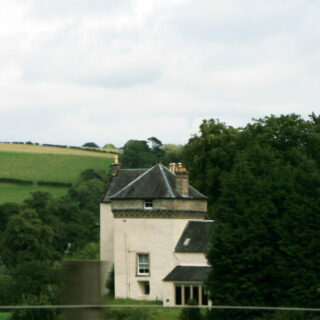 Sauchie Tower was bought in 1982 by Robert Heath and Alexander Mair with the intention of restoring it for use as a dwelling. In November 1984 and March 1985 an archaeological excavation was carried out to learn more about the tower, concentrating on the basement levels and the first floor with some limited investigation of features within the courtyard. 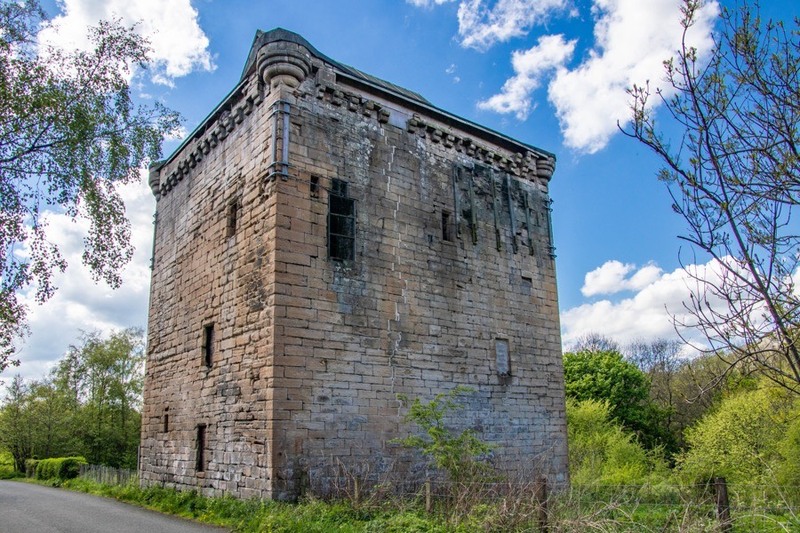 The Friends of Sauchie Tower was set up in 2002 to try to protect the tower from further decline, learn more about its history, and restore it. 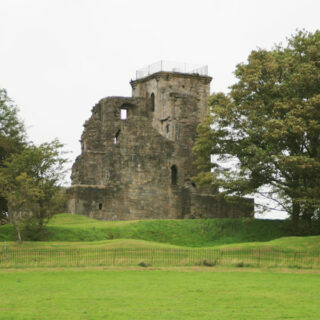 In 2005 a community excavation led by Addyman Associates was undertaken involving the Friends of Sauchie Tower and funded by the Heritage Lottery Fund and Clackmannanshire Heritage Trust. Sauchie Tower is in the parish of Clackmannan and the county of Clackmannanshire. Published on the 14th of May 2010 at 2:00 pm. Updated on the 21st of June 2018 at 2:05 pm.